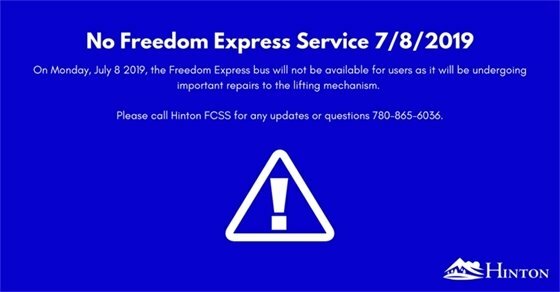 On Monday, July 8 2019, the Town of Hinton Freedom Express bus service will be suspended due to mechanical issues. The Town of Hinton expects services to return to normal on Tuesday, July 9, 2019, and appreciates your patience while we ensure we can continue to offer this important service. Please call Hinton FCSS for any updates or questions 780-865-6036.